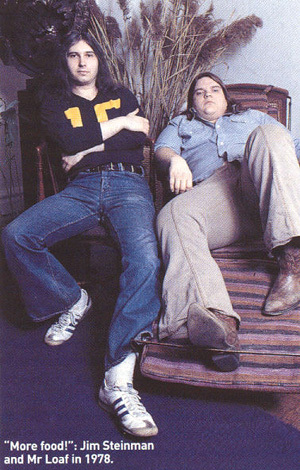 Its probable that the terminal unhipness of Meat Loafs Bat Out Of Hell among the music intelligentsia initially owed as much to its sleeve as to the pantomime heavy rock that constituted the music. As punk seized the UK music world in 1977, Bat Out Of Hell crash-landed from the States like a monstrous anachronism. Packed with eight-minute songs of staggering, grandiloquent verbosity and larynx-straining rock opera, its impossible to conceive of an album that was more indifferent to the late 70s zeitgeist. The cover was a case in point. Where the Jamie Reid inspired fashion in UK sleeves was for harsh, stenciled graphics, urban graffiti-style lettering and abrasive street simplicity, Bat Out Of Hell lurched into view wrapped in a baroque, elaborate design that a 14-year old Dungeon & Dragons aficionado might have rejected as far too lurid and gaudy. It is triumphantly, unrepentantly ridiculous. Given the chequered history of Bat Out Of Hell, its amazing that Meat Loaf and his writer Jim Steinman ever got as far as commissioning artwork from Corben. Corben, meanwhile, had made a name for himself by 1977 on ghoulish mags like Fantagor, Slow Death, Skull, Eerie, Creepy, Vampirella and Bloodstar, although its likely that Meat Loaf and his partner Jim Steinman became aware of him via his seminal magazine Heavy Metal. Steinman, who single handedly conceptualized and wrote all the songs for Bat Out Of Hell, briefed the artist closely for the sleeve. Corbens visual interpretation of the music was both faithfully literal and undeniably spectacular. Its easy to snipe that he merely drew the lyrics of the title track, Im gonna hit the highway like a battering ram on a silver black phantom bike / I gotta break it out now before the final crack of dawn - like a bat out of hell Ill be gone when the morning comes. Corben clearly obeyed Steinmans commands to the letter. Nevertheless, the gothic imagery is unforgettable. Under a blood-red sky, a naked wildman of impressively sculpted musculature screams as he rises above a dark, bleak graveyard on a steel machine that is adorned with a flowing mane and tail. A solitary bat perched on a crypt tower howls encouragement to this lonely horseman of the apocalypse. Spiral Scratch it wasnt. Bat Out Of Hells grotesque vision was perfectly realized by Corben by oddly subverted by the photograph on the albums back sleeve, which showed a shapely woman with her back to the camera wrapped around an inscrutable Steinman, while a frilly shirted, sunglasses wearing Meat Loaf pinches her behind. Inevitably, the juggernaut that was Bat Out Of Hell crushed the punk rivals like a fly and went on to become the third best selling album of all time. Richard Corben, now 60 years old, is still living in his native Kansas City and illustrating dark comics as well as making odd animated films such as Gateway To Terror, Labours Of Hercules and Neverwhere. Its an aesthetic Steinman and Meat Loaf would surely have endorsed.